It's no secret that I'm not a fan of facial cleansing wipes and whilst I appreciate that they offer a quick and easy skincare solution, so do cleansing waters which are more beneficial for the skin. 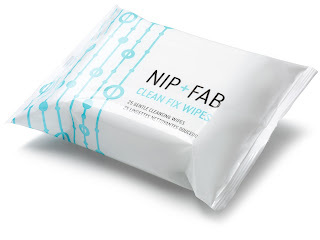 Having said this, there are rare occasions when I reach for cleansing wipes and I've recently been impressed with the NIP + FAB Clean Fix Wipes from the wallet friendly brand created by the founder of Rodial. The packaging is sleek and appealing, however, I'd have prefered a secure plastic clip fastening as opposed to the sticker to avoid the wipes drying out. For me, this is something which is particularly desirable given how rarely I use wipes. The wipes themselves have a fresh scent and are satisfyingly saturated with cleanser, making them more effective than most at removing makeup. The fabric feels soft and strong- I even tried to rip these and they didn't tear. I liked that they are free from drying alcohol but instead feature soothing aloe vera and hydrating glycerin in the ingredients list. Having said that, I did experience a slight stinging sensation when using these on the more sensitive areas of my face. Also, I found that my skin felt slightly dry after use so I couldn't forgo moisturiser. However, overall, I was pleasantly surprised by Clean Fix Wipes and as a result, am keen to discover more from the NIP + FAB brand. At £4.95 for 25 wipes, I feel that these are fairly priced. I'm never going to recommend wipes as an everyday skincare option but if you're looking for some wipes to use occasionally, these are worth checking out.